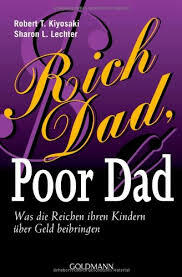 The "Rich Dad, Poor Dad" is the story of a person who is actually the narrator and author and has two fathers: the first was his well educated biological father, termed as the "poor dad" - and the other was the father of his childhood best friend, Mike, termed as the "rich dad" who is less educated. Both fathers taught the author how to achieve success but with very disparate approaches. Throughout this book, the author compares both fathers – their principles, financial practices, ideas and degree of dynamism and how his real father, the poor and struggling but highly educated man, against his rich dad in terms of asset building and business acumen. We have omitted chapter 5 as it is irrelevant to stock market.